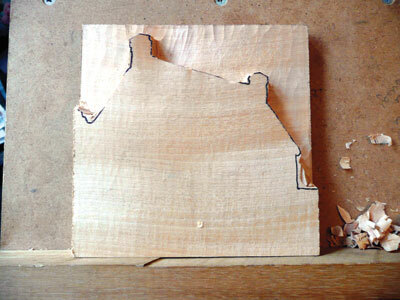 This next project will take you into the realms of what many people regard as 'real carving'. 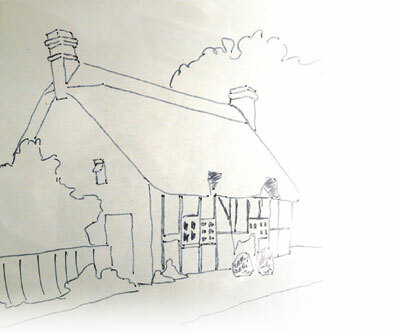 Relief carving is at the heart of much of the work that you will see in stately homes, churches and other public buildings. It also features largely in furniture decoration. The project can either be given a natural finish or painted. 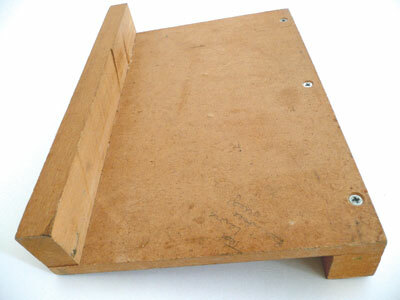 You will need a piece of 25mm-thick timber; lime or jelutong would be best but anything you have handy will do for this exercise. 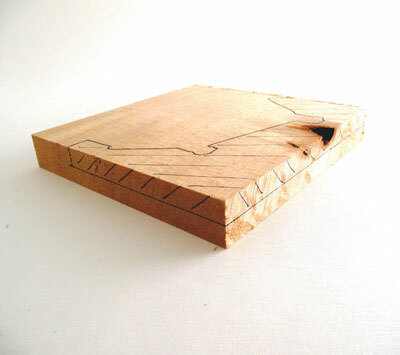 Be conscious of the grain pattern in the block - it may be very attractive but unsuitable for the design you are using. 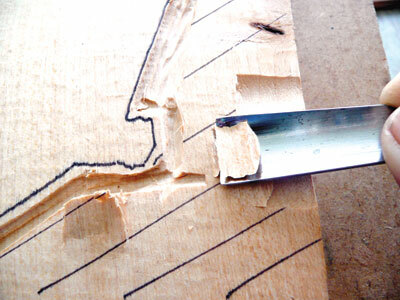 Be wary of grain that would not help the design you are trying to carve. Any stripe effect will detract from the perspective that you will need to include. You will also need to decide which direction you wish the grain to run. In this case it will be horizontal (or across the picture). The pattern is based around a 150 x 150mm (6 x 6in) square, but you can always scale it up if you wish. Whatever you decide, the pattern needs to match the size of the block. 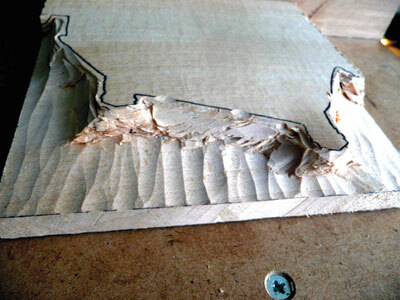 The next part represents your first problem - if you draw the design onto your board, as soon as you start carving you will cut it all off. Many carvers carefully try to avoid this by cutting close to the lines, vainly hoping that they will succeed in carving the design without actually obliterating any lines - WRONG. The first thing you must do is to identify what part of your design is furthest away from you (the background) and then outline this as best you can on the block. My block had a knot in it. This need not be a problem as you might be able to position it so that it is cut off with the background - this is part of the planning. You carve relief from the back forwards. Establish your depth first to find out how much wood you have to play with. Carving from the front backwards will result in very shallow carvings with no significant shadows and may also result in damage to previously carved areas. 1-3 Using carbon or transfer paper draw the outline, as shown, onto your block and draw a depth line all round the edge - initially this should be about half the thickness to give you a 3mm (1/8in) safety margin in case you damage the background during the carving process. You will notice that I have omitted the trees in the background from this outline as these will easily be included in the spare wood that will be removed later. 4 Next, I advise you to trace the whole pattern onto some clear acetate - clear document folders come in handy for this - with a permanent pen; CD writer pens or Sharpies are ideal. This will make more sense later on. Before you start carving you are going to need to have some means of keeping the block still as you go; I don't advise that you fix the block in a vice or clamp as you really need to be able to move it on a regular basis. 5 Instead, make yourself a bench hook of some kind, see Michael Huntley's in issue 13, that you can use on a bench or table. If you don't like this idea you could use non-slip matting, but it is not as effective or as safe. You now have to remove the background down to the line. This can be done most easily with the largest tool in your toolbox, the 5/8in No. 6, and your small 1/8in No. 9. If you are using other tools you need something fairly large, with a sweep between 5 and 8 and a small veiner or, if you haven't got one, a No. 9. 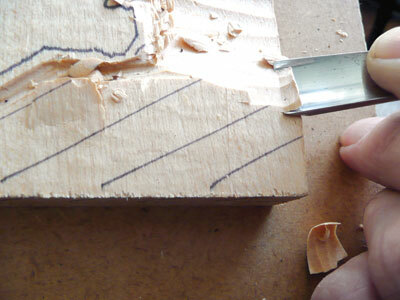 Novices frequently feel the need to go around the outlines with a straight chisel. 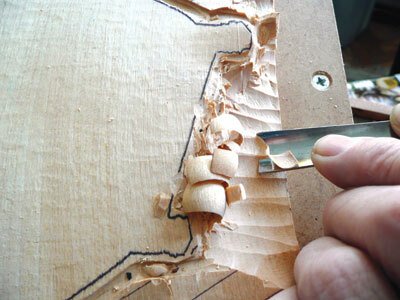 Please do NOT be tempted to do this as you will undoubtedly cause irreparable damage to the edges of your carving. 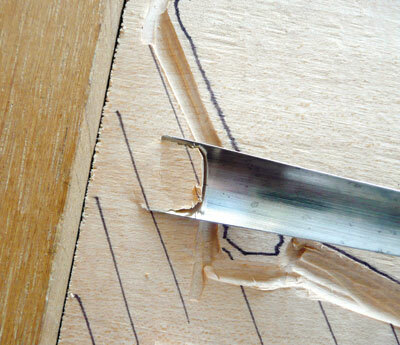 6 Cut a narrow groove about 3mm (1/8in) outside the outline you have drawn (on the waste side!). This will give you a small area of protection when cutting out the waste wood. 7 When cutting out the background it is much better, and easier, to work across the grain. 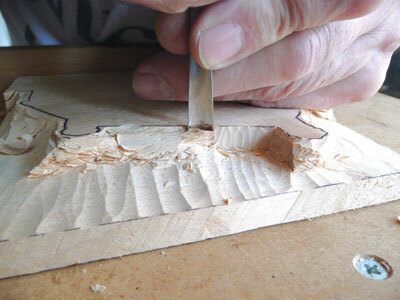 When carving with the grain there is a tendency for a split to run ahead of the cutting edge and you also have to make a separate cut to remove the waste material. 8 If you work across the grain the cut stops exactly at the cutting edge and the waste lifts straight out as you lift the tool. 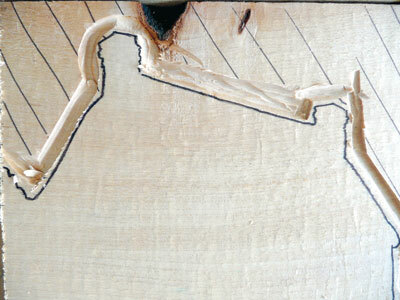 9 Now you can safely start to remove the background; begin at the outside edge and work towards the small trench you have created (this is known as a stop cut, as for knife carving. 10-11 You must be careful not to travel downwards as you go along; if anything it is better to cut slightly uphill as you can adjust this later. Clean off the surface but don't worry about the edge of the roof - this is bound to look ragged at this stage as you will have made cuts into it as you have gone along. When satisfied that you have got the background removed and level, start to cut back to the outline you have drawn, making sure that it is vertical to the surface of the background. 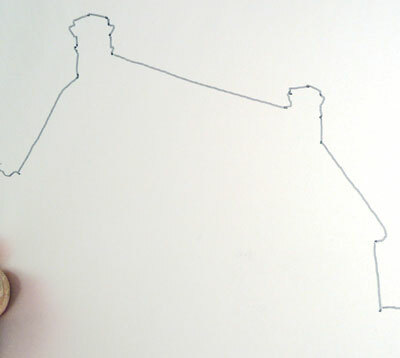 Once you start to shape the the roof your lines will disappear so you will depend on the outline you have cut. Take your time here and get it right. 12-13 Holding your 1/4in No. 3, or something similar, like a dagger, position yourself so that you are looking directly down onto the edge and slowly go around your lines cutting a vertical wall. 14 When you are finished the block should look something like the photograph. Note that the areas on the extreme left and right have not been cut out. This will be a lot easier when there is not as much wood there, and there will be less risk of splitting pieces off. Next time: How to put the 'angles' and perspective into carvings - a factor that is, more often than not, lacking in relief carvings. 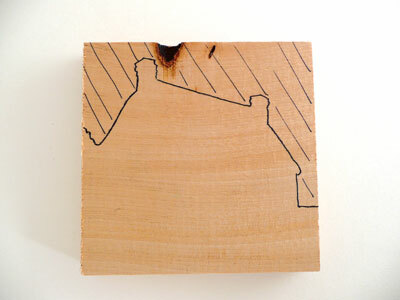 "Once you start to shape the roof your lines will disappear so you will depend on the outline you have cut"